Since the Dryer-Ell is 500 percent more efficient, longer run lengths can be installed without the need for a booster fan. In certain run length situations, the Dryer-Ell can eliminate the need for fans. 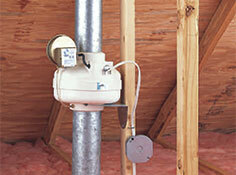 This can simplify installation, remove a mechanical point of failure and eliminate maintenance problems. Do We Really Need a Booster Fan? A booster fan is sometimes the only alternative because of the sheer distance required to exit the building. To place the dryer in very interior locations that require 45 to 60 feet of duct run to exit the structure, the DBF110 Booster Fan by Fantech or our new favorite by Tjernlund are viable options in some jurisdictions. Lately, some local municipalities are shying away from the use of booster fans. Since the International Code Council has adopted the advantage of the Dryer-Ell's longer turn radius--see Building Code Whitepapers--there are some cases where the Dryer-Ell is an outstanding (and cost-saving) alternative to dryer booster fans. If the run requires elbows, the full allowable run length can still be used without a booster. "I am an Architectural Engineer and in the process of constructing an 8 unit apartment building for myself. The dryer runs with a traditional 90 bend would have been 32ft. By using your product I was able to meet IMC 2006 requirements without installing any booster fans." "I am the custom home supervisor with Nuccio Air and get Red Tagged all the time for dryer runs over 25 feet. Yesterday for example I was rejected for a run that was 27 feet. The builder did not want to pay the $400 for a booster fan so finding your dryer-ell provided me an alternative that saves me a lot of heart ache. I think it's one of the best new items I've seen for our industry in a long time. 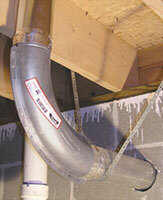 In our jurisdictions, length of run issues with the dryer conduit are real and all the time cause us heart ache. The savings each of these provide will be a huge benefit for our company and all the other trades that work in our four municipalities region (Counties of Hillsborough, Pasco, Hernando and the City of Tampa). My hat's off to you for the innovation and delivery of a product well over due. " "I have contractors screaming for this product. Without your Dryer-ell they are required to install expensive booster fans. These contractors have reviewed your engineering data and view the product as an excellent alternative to installing a booster fan. I have also spoken with other distributors in our area and they too seem very interested in carrying this product. I like it and we are ready to get some in here." You may also find additional testimonials by following the Testimonials Link.